For those of you unaware, Animal Crackers have been enjoyed as a tasty snack since the mid nineteenth century. Today they are made by numerous well known companies, such as Keebler, Nabisco, or the Stauffer Biscuit Company. Although store bought varieties are delicious, most people will agree that homemade animal crackers are the best. If you haven't made your own animal crackers before, then we encourage you to try it out. Our website hosts a variety of recipes for animal crackers, all of which can be made right from the comfort of your own kitchen. Try recipes such as Homemade Animal Crackers, Oatmeal Animal Crackers, Classic Animal Crackers, Cheese Animal Crackers, Chocolate Animal Crackers, and many others. If you have your own animal crackers recipe, then you should know that we also accept user submitted recipes for publishing. We would like to take this time to thank you for visiting our website. If you have any questions about our site or it's content, then please feel free to send us an email. General response time to any inquiry is six to twelve hours. 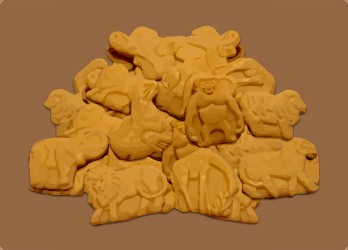 We would like to wish you all a very sweet and delicious animal crackers experience. This homemade animal crackers recipe was sent to us by John from Winnipeg Canada. For the first step you will want to grind your oats in a blender until they are almost a powder. Add the ground oats to a mixing bowl, along with the table salt, brown sugar, whole grain teff flour, and baking soda. Sift these ingredients together until the mixture is nice and even. Next cut in the unsalted real butter, while keeping the pieces at roughly pea size. Moving along, next add in the honey and liquid buttermilk, then vigorously stir the ingredients together until a firm animal cracker dough forms. Once your dough has been created, place it in a sealable container and then slide it into the refrigerator to chill for one hour. While your dough is chilling, preheat your oven to 400 degrees Fahrenheit, or 200 degrees Celsius. Next take out your dough and roll it across a clean floured surface. You want the finished dough thickness to be about one eighth of an inch. At this point you can take out your animal cracker cutters, and begin making a variety of different shapes. Place the cut crackers on to a greased baking sheet, then slide them into the oven to bake for six to ten minutes, or until they are lightly toasted around the edges. Let the animal crackers cool on wire wracks before serving them. We would like to thank Shawn from Key West Florida for submitting this amazing oatmeal animal crackers recipe. To begin, please take out a mixing bowl and add in the white superfine sugar, old fashioned oats, baking soda, and kosher salt. Vigorously stir these ingredients together until you have an even distribution throughout. Moving along, next cut in the all vegetable shortening until it's crumbly. Next add in the hot water and pure vanilla extract, then stir all of these ingredients together until a cracker dough is formed in your bowl. You want the dough to be fairly stiff. Once you are done with that step, you will want to lightly flour a clean surface, then roll out the dough to an eighth of an inch thickness. You can now dip your animal cookie cutters into flour, and then begin to create your various cracker shapes. Once you have enough cracker shapes, transfer them to a greased baking sheet using a spatula. At this point you will want to bake your animal crackers at 350 degrees Fahrenheit, or 175 degrees Celsius. The crackers should turn golden brown in about eight to ten minutes, at which point you should remove them from the oven. Do be sure to let them cool down before serving them. These oatmeal animal crackers go great with a tall glass of cold 2% milk. We hope you have enjoyed this recipe as much as we have. I whipped up this chocolate animal crackers recipe especially for my daughter, and it turned out awesome. To begin you will first need to take out a food processsor and plug it in. Pour the Scottish oatmeal into the processor and pulse it until the oats are near a powder consistency. Next add the ground oats to a large mixing bowl along with the table salt, and then sift them together. Next add in the cocoa powder, white flour, baking soda, honey, almond extract, vanilla extract, organic buttermilk, and salted butter. Stir the contents together until a firm animal cracker dough takes shape. If you find that the dough is too dry, then simply add in more buttermilk. You are also more than welcome to either increase or decrease the cocoa powder proportion, it depends on your own taste preference. Moving forward, now that your dough is done, place it in a sealed container, and then slide it into the refrigerator to chill for one full hour. Once the dough has chilled, roll it out on a floured surface to an eighth inch thickness. Using flour dipped animal cracker cutters, create a variety of different cracker shapes. Place the cut out crackers on to a greased cookie sheet. You will want to bake the chocolate animal crackers at 350 degrees Fahrenheit, or 175 degrees Celsius, for roughly ten minutes. Once baked, be sure and let the animal crackers cool on wire wracks. I would like to thank Tony from Portland Oregon for submitting this unique cheese animal crackers recipe. To begin you should first take out your food processor and plug it in. Add in the cubed Parmigiano Reggiano cheese, and pulse until it's ground up. Pour the processed cheese into a mixing bowl, and then whisk in the white all purpose baking flour and kosher salt. Once these ingredients are evenly blended, using your fingers to mix it into a coarse texture. Moving along, next hollow out a hole in the center of the dough, and then pour in the milk and egg. Vigorously stir these ingredients together until a firm dough has formed. You will now want to flour a clean surface, and begin kneading your dough for about two minutes. Once you are done with that step, place the dough into a container, and then slide it into the refrigerator to chill for one full hour. Once the dough has chilled, preheat your oven to 350 degrees Fahrenheit, or 175 degrees Celsius. While your oven is heating, roll out your chilled dough to an eighth inch thickness. Cut out animal cracker shapes using floured cookie cutters. Place the cut crackers on to a lightly greased baking sheet, and then slide them into the oven to bake for six to ten minutes, or until they are slightly golden. Be extra careful not to burn them. Once the cheese animal crackers have baked, let them cool on wire wracks. That concludes this delicious recipe, please do be sure and check out all of our other tasty recipes for homemade animal crackers. To begin this classic animal crackers recipe, you should first preheat your oven to 400 degrees Fahrenheit, or 200 degrees Celsius. Next take out a blender, add in the oatmeal, then grind it until it's reduced to a fine powder. Next take out a large mixing bowl, and then add in the ground oatmeal, baking soda, and table salt. Sift this initial batch of ingredients together. Moving along, next cut your butter into pieces that are roughly pea size. You can now pour in the buttermilk and honey, vigorously stirring the mixture until a firm animal cracker dough has formed. Next up, clean and flour a flat surface, then roll out your animal cracker dough to an eighth of an inch thick. At this point you can take out your animal cracker cookie cutters, and make a variety of different shaped pieces. Place your finished crackers on to a greased baking sheet, then slide it into the oven to bake for five to seven minutes, or until the animal crackers turn a light brown color. Once the crackers are done, let them cool down on wire wracks. That concludes this unique and delicious crackers recipe, please don't forget to browse around our website for other delicious animal cracker recipes.